US stock futures are rallying following a session that took the major indexes to the best level of the year. Near 7:44 a.m. ET (9:44pm AEST), Dow futures were up 52 points (0.29%), S&P 500 futures were up 5 points (0.2%) and Nasdaq futures were up 10 points (0.23%). It’s not much action, but the gain brings stocks that much closer to all-time highs. The S&P 500 closed 1% short of the record closing high of 2,130.82 it reached last May. Stocks rose after Federal Reserve chair Janet Yellen affirmed that interest-rate hikes would be gradual and only in response to strong economic data. Right now, she sees the positives in the data outweighing the negatives. 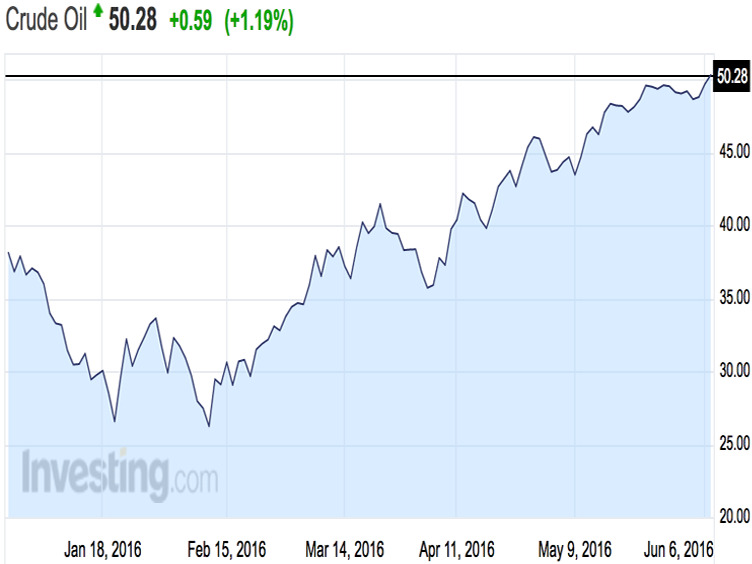 Crude oil prices climbed to new highs of the year. West Texas Intermediate crude futures in New York for July delivery rose 1.3% to $50.34 per barrel. Following Yellen’s assurance of gradual rate increases, the dollar fell, and traded near a one-month low on Tuesday. There’s no major economic data on the calendar on Tuesday, except for the consumer credit report from the Federal Reserve at 3 p.m. ET. It’s forecast to show that credit grew by $18 billion in April according to Bloomberg, down from $29.674 billion in the prior month. In corporate news, Valeant shares tanked by as much as 17% pre-market after earnings results showed a first-quarter loss and lowered guidance for 2016 profits.